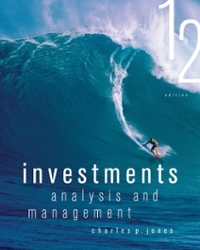 Investments 12 Edition In today’s economy, it’s critical for investors to have a strong understanding of the strategies needed to make the best decisions. Jones arms them with the most up-to-date information in the field while offering a proper balance between investment opportunities, techniques and analytics. He includes new discussions on the rapid rise and interest in exchange-traded funds, the new NYSE-Euronext market, the merger of the NYSE and Amex, and more. Expanded coverage is also presented in behavioral finance and the bond markets. In addition, investors will benefit from the updated problems and questions that really make them think of the most effective moves before acting.